When you really think about it, there are a lot of social distinctions in Canadian schools, especially in high school. You have the jocks and the nerds, the gamers and the cheerleaders. However, there is another set of divisions in schools: students who are perfectly fine and with those who have disabilities. Many children are born with some kind of impairment, which can create substantial and long term effects on their ability to do every day activities. These can either being physical, such as muscular dystrophy or cerebral palsy and mental illnesses,which unlike the physical disor ders can greatly inhibit both academic progress and the ability to learn. 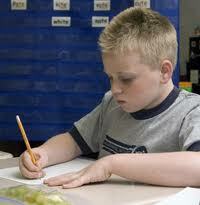 Some of the most common are Dyslexia, ADD (Attention Deficit Disorder) and Autism. The latter may not stifle academic success in certain subjects like math or science, but it is a known cause of social problems for students. It is also important to make sure students having issues with reading, writing, and math, as well as difficulty controlling emotions and/or concentrating on their work, are given proper assistance. It just might help them succeed. In May of 2000, the Programme for International School Assessment administered tests to 15 year old Canadian students in each province (2). These tests were grouped into three domains: reading, math and science, and were used to survey academic performance of students with and without disabilities (physical and mental). Students with reported cognitive/emotional disabilities in all provinces have achieved way below the national average of 530 and a lot lower than the students with only physical impairments. Disabled Newfoundland students scored the lowest at just around 390. This may well continue, if school boards either do not provide the necessary accommodations, or do not challenge these students hard enough so that they realize their potential. So what exactly is the big deal regarding all of this? All students, regardless if they have something wrong with them or not, should not be denied the help they may need now or in the future. Some of them may need not just a boost in academic support and confidence, but financial support. Chances are your school will have to accommodate a student in a wheelchair. In that case, proper ramps and elevators will be needed. In 2001, 59% of disabled students in Canada are in regular classes. (2) Thus, they are prone to being bullied and looked down upon by others who are not like them. To address this, schools need to create greater awareness of disabilities, so as not to leave these students out of the picture. Statistics Canada, Children with disabilities and the educational system — a provincial perspective.